TV on Blu-ray: "The Office: Season Nine/The Farewell Season"
The Office writers and producers dug themselves into a creative hole by the end of their 8th season. The show was adrift as they tried to carry on after Steve Carell left the series. The Office was still pulling in decent ratings, so when the peacock network renewed it this wasn’t too big of a surprise. After all, many a great sitcom has outstayed their welcome. However, the network decided that season 9 would be the end for The Office, and with it’s conclusion approaching, there was an opportunity for redemption. I’d say that The Office almost redeemed itself throughout season 9. While not as consistent as previous seasons, it managed to come up with some funny and endearing moments throughout its 25 episodes. The addition of Jake Lacy as Pete and the always enjoyable Clark Duke as Clark certainty brought a youthful invigoration to the show. At times, these two played like young versions of Dwight (Rainn Wilson) and Jim (John Krasinski). The plight of Angela (Angela Kinsey) and her relationship with Oscar (Oscar Nunez) was also one of the highlights of the season for me. Like most shows heading into the sunset, this final season had that “we must wrap up everyone’s lives” feel to it. Andy (Ed Helms) pursued a career in entertainment, Erin (Ellie Kemper) tried to find true love, and Darryl (Craig Robinson) started his own business with Jim. There was one letdown: the decision to have Jim and Pam (Jenna Fischer) suffer marital woes after Jim decided to join Darryl in that new business venture. For eight years we’d watched Pam and Jim portrayed as a loving, understanding couple who shared everything. Yet the moment that love met challenges, the two characters buckled too easily. Pam even began a flirtation with one of the camera crew. This contrivance felt very forced so late in the series. The show righted itself by the end, though, with a string of episodes that were focused, full of heart and very, very funny. Carell’s appearance in the series finale was the worst kept secret in television, yet the creative team still managed to have it come off as a surprise. The love/hate relationship between Jim and Dwight ended on a positive note, Pam and Jim reunited, and Dwight finally took his rightful place in the manager’s office. Everything ended in a twisted fairy tale fashion that felt appropriate for the show. The Office is one of the most important TV comedies from the new era of television that began in the early 2000s. It popularized the mockumentary sitcom and set the trend for single camera shows. Some will argue that it should have ended when Carrell bowed out, but I disagree. The series was still funny when he departed and there was no reason to assume it would crash like it did in season 8. I’m happy that it stuck around one more year. In the end, I was sorry to see the characters go and the final credits run. Thankfully, home video will allow me to revisit the gang at Dunder Mifflin any time I want. 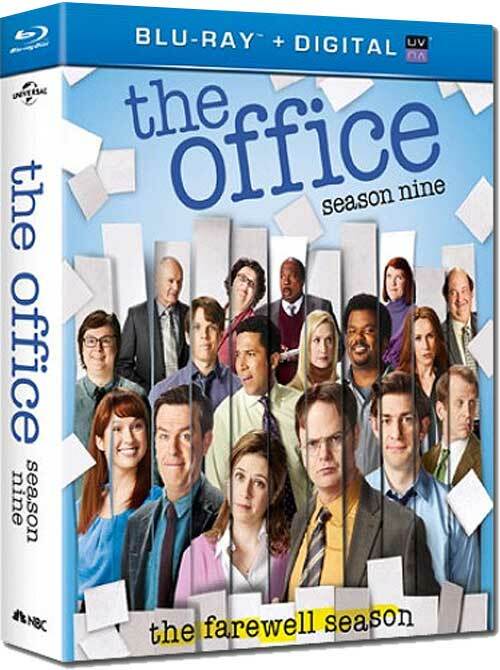 The Blu-ray release for The Office Season Nine/Farewell Season has 5 hours of content that awaits you. Included are audition tapes that have never before been seen, deleted scenes that clock in at over 2 hours, a recording of the cast table read for the show finale, farewells by the cast, and an exclusive to the Blu-ray release: a behind-the-scenes panel discussion about the series and its impact on television. In addition, the Blu-ray comes with Ultraviolet instant stream and digital download. M.I.A. ‘Come Walk With Me’: D.O.A. or OMG?